The use of whole body vibration technology is not new; in fact, WBV machines as we know them today are not completely different from the models used a few decades ago, the basic functioning principles being the same. A whole body vibration machine sends vibration waves throughout the body, stimulating muscle contractions, enhancing the circulation of blood and lymph and contributing to an overall better health state. WBV platforms are used all over the world, in fitness centers, beauty salons, health clubs and hospitals, being excellent additions for the treatment of various conditions, from osteoporosis to diabetes and COPD. They’re also useful tools for fitness enthusiasts who want to increase the intensity of their workouts, and for athletes who are looking for more diversity in their warm-up, stretching or training sessions. 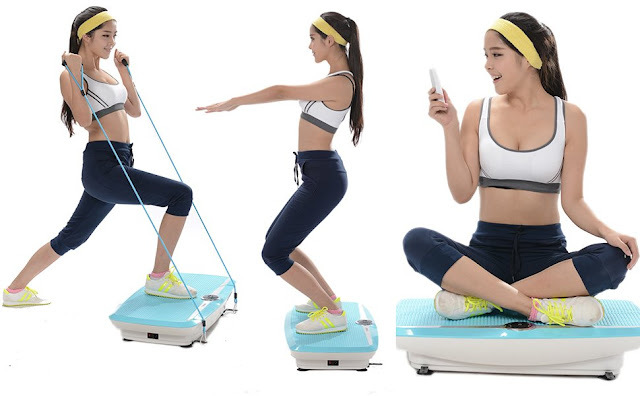 An innovative fitness and health device, a whole body vibration machine can provide a wide range of benefits to people of all ages, but there are also some potential dangers associated with this form of workout and therapy. So let’s take a look at some things you should ask your therapist or trainer before using a WBV machine for the first time. 1. What are the contraindications for whole body vibration? As any other form of exercise, WBV can be dangerous for some groups of people. For example, patients who have suffered recent fractures or have recent metal implants, those who have kidney stones, those who suffer from chronic conditions, as well as people with diabetic ulcers or epilepsy should avoid using vibration machines. Although there’s no documented study on WBV training in pregnant women, it’s recommended for expecting women to opt for other types of workouts, and avoid vibrating plates. So in general, it’s always better to ask for professional or medical advice before starting a WBV routine. 2. Is training on a whole body vibration machine safe for healthy people? The short answer is yes, and even for people with various ailments: this method can lead to improvements in their health state. Whole body vibration machine training has been found by hundreds of studies to be risk-free in healthy adults, in teenagers and in older people, women and men alike. There aren’t many documented side effects except for dizziness in some cases, or a tingling sensation in the limbs if the body is not used with the enhanced blood flow. The number of people who experienced negative reactions from WBV is very low. Still, this doesn’t mean training on a whole body vibration machine will have the same effects on anyone. So your body might react differently until you get used to this method of training. 3. What can I expect in terms of results from a whole body vibration machine? A vibration platform is both a training and a treatment tool, which means there’s two main categories of effects: first, you can expect improvements in your appearance. Your body weight may drop, your body fat percentage may drop, you may see that your legs and feet no longer look swollen, your belly looks less bloated, your skin and hair look nicer. These happen because WBV not only strengthens the muscles and improves the circulation of the blood and lymph, but it also supports the elimination of toxins from the body, improves the mood by regulating hormone levels, and improves the flexibility of muscles and joints. You can expect to have more energy, to sleep better, to have more mental clarity, and to see your flexibility and balance improving. WBV has been found to be useful in regulating blood sugar levels, in speeding up recovery from injuries, in improving the pulmonary capacity, the bone density, in decreasing cellulite appearance and decreasing back pain. All these are effects that may be experienced after training on a whole body vibration machine. Yet, don’t expect to notice significant improvements with only 1 training session per week. A whole body vibration session takes around 10 minutes per day, and should be practiced consistently for long-term results.